My name is Chris. I have a lot of hammers. I am a Tucson native. I grew up in the desert on the Northwest side of town. Back then it was still mostly wild; the strip malls, tract homes, and retirement communities had not yet arrived. I started learning about welding and fabrication in 2011. It was a midlife career change. Within a couple of years one friend lent me an anvil and another gave me a forge, and I started exploring what hot steel can be made to do. I got some help in October 2013 when I made friends with a retired local blacksmith named Tom Bredlow. Tom opened the door to all kinds possibilities, and I began to appreciate the depth of what I had gotten in to. Nowadays I am especially interested in hand skills. Broadly speaking, this means using handheld tools and my own judgment to manipulate material. To this end I have been working on many small pieces and work studies. I am also available for bespoke architectural work where a discerning eye and skilled hand are appreciated. ​Not everything I do is fine ironwork, and I am happy to help homeowners with more pragmatic needs. I occasionally collaborate with architects, builders, and designers on comprehensive metalwork projects. I am interested in many different metalwork traditions. Here are some things that especially inspire me. I know and care a lot about early and mid 20th century ironwork in Tucson. Besides my extensive knowledge about my friend Tom Bredlow's work, I have a collection of tools, samples, and scrap pile items related to Raul Vasquez, Ole Myrmo, and other local blacksmiths and shops from days bygone. Fritz Kühn is one of my favorite artists. He was accomplished as both a blacksmith and a photographer, and did not disappoint as either. In the realm of metalwork, he excelled at both formal German ironwork and also modernist metal art. I love that his modernist work was so aesthetically disconnected from his traditional work. Besides Fritz Kühn's metalwork, I enjoy the work of Albert Schmidt, who had a similar breadth of work. By any metric I can think of, Samuel Yellin was the greatest American Artist Blacksmith of the 20th century. In his time he was the king of Gothic Revival and handmade ironwork (there is even a specific term for some of his work: "Yellin Gothic"). Yellin's shop had an impressive and unmatched list of accomplishments. He provided ironwork to many Ivy League schools, the Federal Reserve Bank, Washington National Cathedral, and the estates of many of the 20th century's American industrialists. Much of what I know about Yellin is connected to his work in Washington National Cathedral. Washington National Cathedral in Washington D.C.
Over a roughly 15 year span, my friend Tom Bredlow produced some Washington National Cathedral's finest ironwork. During his tenure Tom became a general authority about the cathedral and its ironwork. 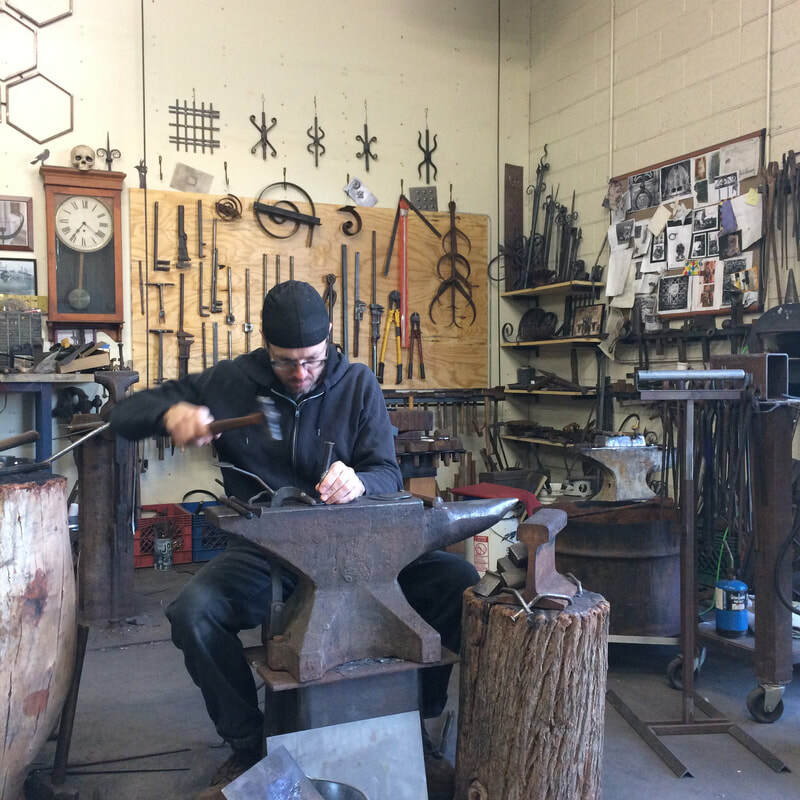 He collected everything from building blueprints and full sized ironwork drawings to correspondence, samples, tests, and scrap pile items related to Samuel Yellin and other blacksmiths who produced work there. ​I have developed a strong affinity for that building. 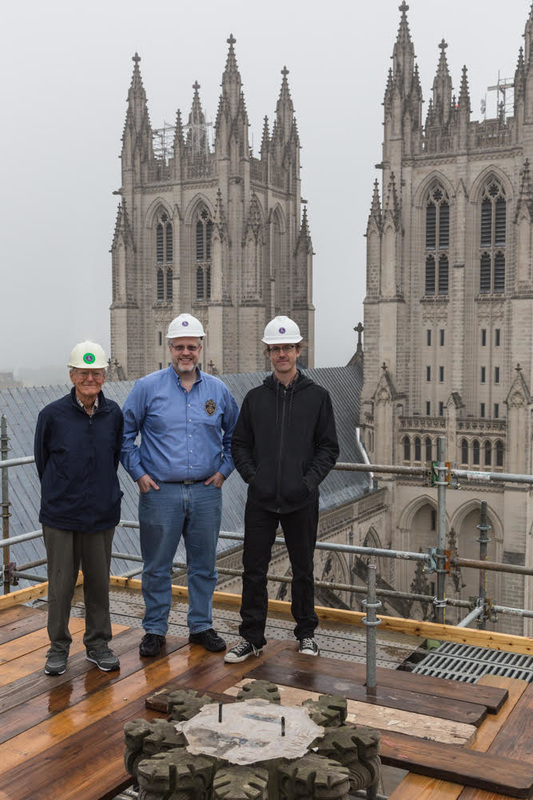 Left to right: my friends Tom Bredlow, Chris Budny, and I on the scaffolding at Washington National Cathedral observing earthquake damage. Washington DC, 2016.